Now that is style. And of course I mean the back tyre of my Velorbis Scrap Deluxe on the left. 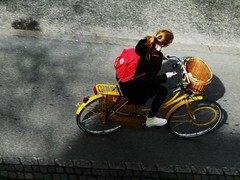 One last dash of yellow bike in the afternoon light. Marie and I were sitting outside at a café nearby here and watching the bikeworld go by. Not really feelin' the love for the cruiser bikes, they look uncomfortable to ride and I would imagine they would be very tiring on the legs; that's just the impression I get. The middle one I love and brought a smile to my face when I looked at it. Any idea what the circle bar around the front wheel spokes is for though? never seen that before. Christina's comparing, I assume, with the riding stance of a quite-high seat and drop bars. The two use very different groups of muscles, I've read. The optimum pedaling-speed efficiencies apparently are different as well. The drop bar/hi-seat requires a high RPM kind of "spin" pedaling while the sit-upright/lower-seat requires a pretty-low RPM kind of pedaling. In order to keep high-RPM pedaling in the efficient range, many gear ratios are required while the other can get by with very few gear ratios. But back to Christina's comfort comment, what she calls cruiser bikes really aren't uncomfortable because of using the muscles differently. 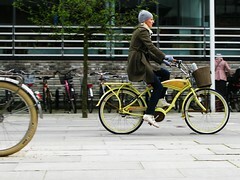 Beautiful...may have to hurry up and get that yellow Raleigh I found rebuilt and go for a ride. And as A. Nony Mous pointed out it does use a different muscle group and require a different cadence and style. I have seen people with chronic pain have it greatly relieved just by changing to a more up right position on the bike.